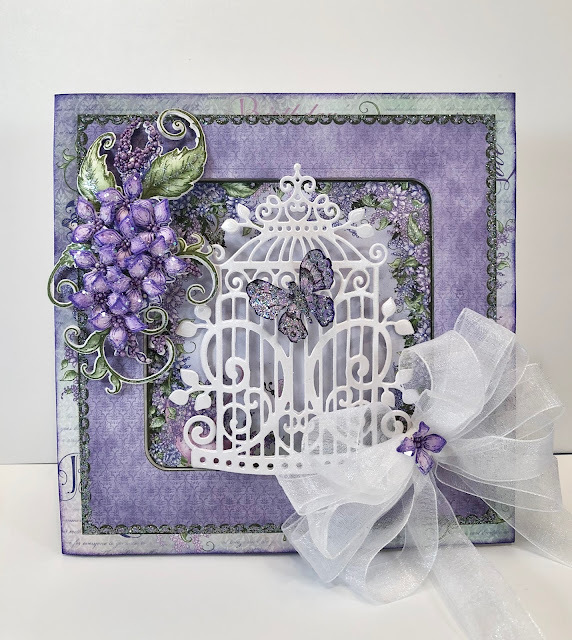 I just love release day and today Heartfelt Creations has released the GORGEOUS Lush Lilac Collection! I'm in love with this beautiful collection and so excited to share the card I created for the release. Here's my Sparkling Lush Lilac. Other Products: Pearl White Metallic Cardstock, Dimensional Tape, Sponge, Hot Glue Gun, White Sheer Ribbon from Michael’s. Misti, Big Shot Plus, Scissor, Quickie Glue Pen, Bow-it-All 2. Instructions: Cut pearl white metallic cardstock to 6” x 12”. Score at 6” to create a 6” x 6” tent fold card. Cut one of the 6” x 6” card panels from the Lush Lilac paper collection and ink the edges with Deep Purple Ink. Use the square die from the Cut Mat Create Die set and cut out the center of the card panel. Adhere the frame of the card panel to the card base using dimensional tape. Cut another 6” x 6” card panel, ink the edges and adhere to the inside of the card. Cut the Lilac swirl from the paper collection using the Lush Lilac & Umbrella Spray Die. Cut another one from white cardstock and adhere them together using dries clear adhesive. Spritz with water and shape using the Deluxe Flower Shaping Kit. 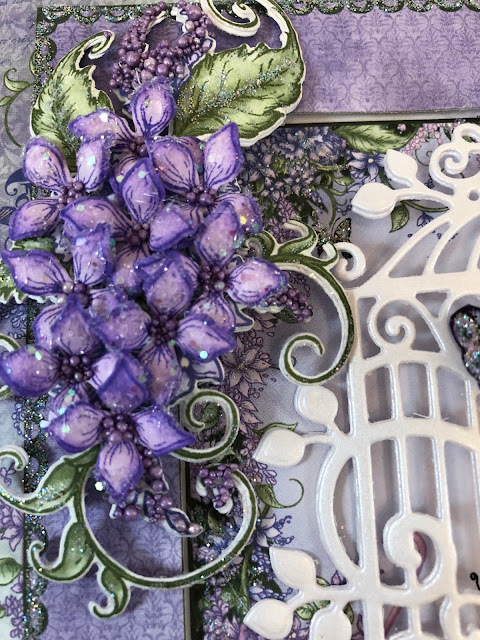 Stamp the lush lilac flowers on white cardstock using Archival Deep Purple ink, color with Memento Lulu Lavender and diecut using the coordinating die. Ink the edges of all the flowers with Deep Purple. Place face down in the Lilac 3D Mold, spritz with water and run through the die cutting machine. Place on the molding mat and use a stylus to press down in the center of each flower. When dry, sponge with dries clear adhesive and sprinkle with Rajni Chawla’s Crystal Clear glitter. Put a small drop of glue in the flower centers and sprinkle with I Cannot Tell a Lilac Prills. Adhere the flowers to the lilac swirl using a hot glue gun and add prills to the lilacs on the swirl. Using Pearl White Metallic cardstock, diecut the Cage twice from the Sweet Lilac Scroll & Cage Die set. Adhere together and shape with the deluxe flower shaping kit to give it a curved three dimensional look. Adhere the cage to the square center panel of the card front and adhere the panel to the card base using dries clear glue. 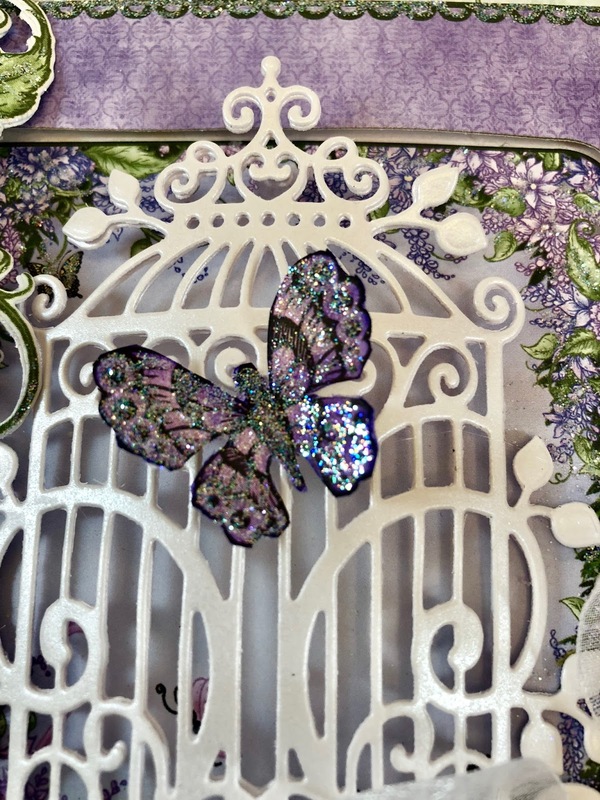 Fussy cut a butterfly from the paper collection, use a Quickie glue pen to add Crystal Ultrafine Transparent Glitter. Lightly shape and adhere to the front of the cage. 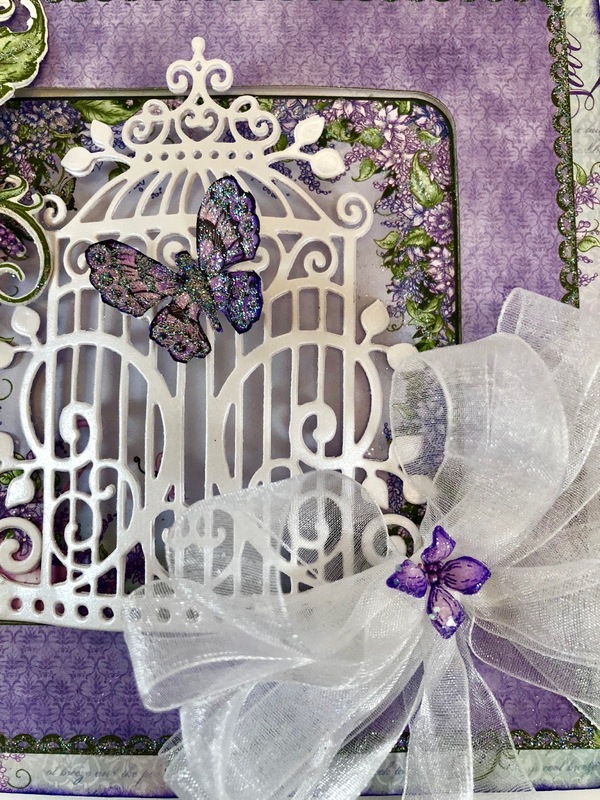 Using the dimensional dots, adhere the lilac swirl to the top left of the card front. Add ultrafine transparent glitter to the leaves, all the flowers on the paper and the scallop design all around the card front. Use the Bow-it-All to create a 6 loop bow from sheer ribbon and adhere to the card as shown using the hot glue gun. Add a lilac flower to the center of the bow. 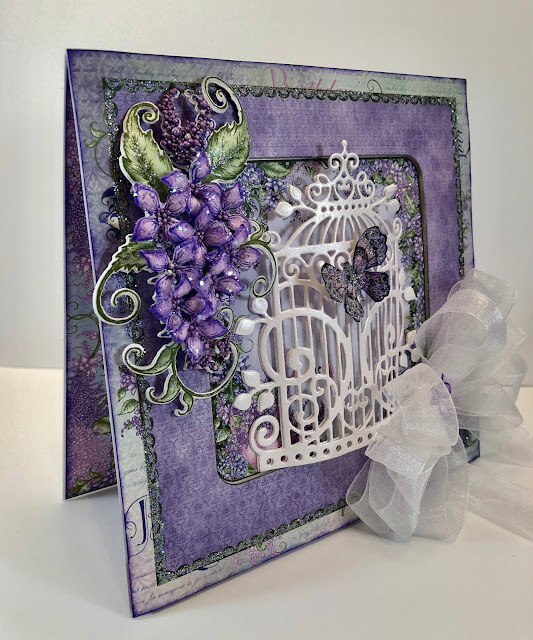 Heartfelt Creations Blog to see the absolutely "to die for"
Janet, this is stunning! I love the bit of curve on the card giving it a bit more dimension. Well done you! This is so beautiful Janet!! I LOVE that sparkly butterfly on the bird cage! Lovely blooms and beautifully framed! Just gorgeous my sweet friend! Gorgeous and oh so sparkly. I love what you have done with the bird cage and the butterfly on it.